She can hardly believe what she’s hearing, of course. A fellow zombie, wanting to be human? Aspiring to be like them? If she didn’t know any better, she would think he was still one of them. But his pallor, his fetor, his unkempt appearance, his bulging eyes, his expressionless countenance, even the moan in his voice, all point to the sophistication that characterize their kind. How? she wonders, Again human? One cannot undo death, cannot un-lose one’s innocence. “We give them!” she shoots back. She stares at him a moment, processing his words, almost too much for her. He’s wrong. He’s sacrificing everything she’s worked for, everything she is. She considers destroying him, like the humans sometimes do. 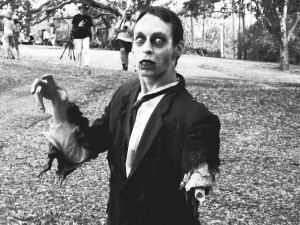 Has a zombie ever destroyed one of his own kind? She wonders: is that why he’s doing this, betraying their kind, out of some misguided love? Indeed, love was a powerful emotion. He reaches his hand out and caresses her face. “I remember how you used to be filled with life, how you used to smile at me. How long has it been since we smiled?” And the corner of his lip inches up, stiffly, just a little. Clearly he is not a full zombie. He is still somehow part human. “You, human,” she says, and she moves to grab him, to attack him as she would a human. He gazes longingly into her eyes, a stare she just barely remembers. She used to be human, an existence she shed a lifetime ago, an existence that embarrasses her, that she wishes she could forget. His gaze bores into her long-forgotten soul, and she wants to lash out at him, to destroy him. But she also longs for it, for his affection. She takes his hand in hers and brings it to her lips. She has forgotten how to kiss, but the feeling of his skin against hers reminds of all she has forgotten. She looks to him for a reaction.